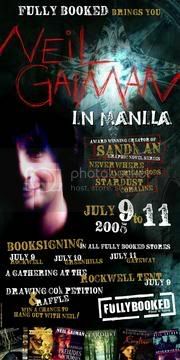 Just in case you didn’t know, Neil Gaiman (author of American Gods, Neverwhere, Coraline and Sandman) will be in Manila from July 9 to 11, 2005. The booksignings will be: The Gathering at the Rockwell Tent on July 9, in Fully Booked The Promenade in Greenhills on July 10, and at Gateway Mall in Cubao on July 11. There will be readings, book signing, an art competition, and a raffle where you can have the chance to have dinner with Neil Gaiman himself. The signing sessions are open to everyone. For more info you can check out the site or join the mailing list. Hey! Better late than never, right?